ACD Projector Rentals Miami provides you with great and reliable rental service. We offer the best Lcd Projectors, Projection Screens, and Big Screens up to 25′, PlasmaTVs from 42″ to 75″ LED, Video Projectors, Computer Projectors, Sound Amplifiers, Lapel Microphones and Wireless Microphones. Serving South Florida, Miami, and Fort Lauderdale areas. Call us 24 hours at 305.386.7696 and 954. 4890 0101. ACD Projector Rentals Miami provides projector rentals and projection screens for your specific needs. When you want to make a professional impression the right projector could make your presentation stand out. If you need to deliver a PowerPoint demonstration in Miami, call ACD Projector Rentals Miami. We will deliver the screen and projector with all the accessories. Projectors attach easily to your laptop with one cable to show pictures, web applications or videos. You can also use a projector with a DVD player or TV cable box. This makes projecting movies and big sporting events more enjoyable and cost effective. Call us 24/7 for your Miami and Fort Lauderdale projector rental needs and we will deliver great service and high end quality equipment. When planning your next event you can rely on ACD Projector Rentals Miami to provide your company’s AV rental needs throughout the Miami and Fort Lauderdale area. We service conference centers, hotels, banquet halls, and corporations with top name brand AV equipment. Our products include: audio mixers, PA systems, and wireless microphone rentals throughout the Miami and Fort Lauderdale area. Contact our audio visual rental division 24/7 for full product descriptions and friendly comprehensive AV rental services, we offer to our valued clients throughout Miami and Fort Lauderdale areas. Presenting the perfect projection with rich and dynamic colors. We offer Computer Projectors, DVD Projectors, Cable Box Projectors, Projection Screens, Microphones and PA systems. From basic projectors to wide screen presentations, you will find all the equipment and the technical expertise you need to hire us. As you plan your next meeting or event, let us assist you with your integration of video elements that will make an impact on your attendees. ACD Projector Rentals Miami is a one stop audio visual equipment rental shop servicing the entire Miami and Fort Lauderdale area. We deliver and set up video systems in the Miami and Fort Lauderdale Area. We offer great service, easy to work with as well as affordable. If you need video, sound, projection or presentation support, or if you are not sure of what you need, give us a call, and let our professionals help you. We will either guide you over the phone, or dispatch a technician with the experience and knowledge, capable of any situation to ensure your event runs smoothly. ACD Projector Rentals Miami provides the technology that will project the best image of your company! 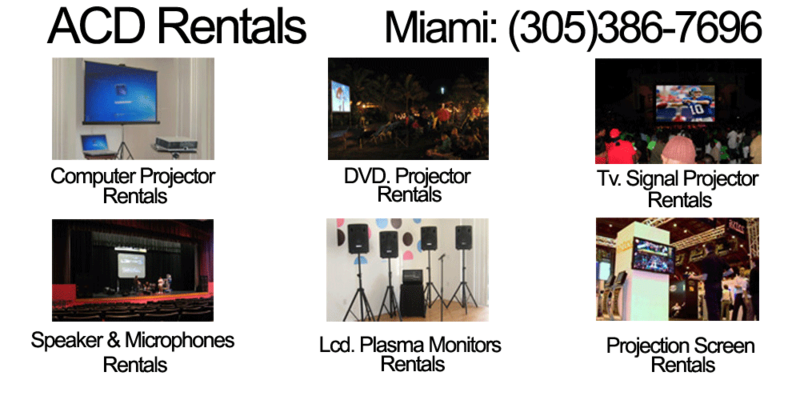 For your convenience, we have Audio Visual Rental points in Miami and Fort Lauderdale: We do Projectors and Av. Rentals in Miami & Broward: you can rent a projector in Aventura, Bal Harbour, Bay Harbor Islands, Biscayne Park, Bayside, Brickell, Coconut Grove, Coral Gables, Cutler Ridge, Doral, Downtown Miami, El Portal, Florida City, Golden Beach, Hialeah, Hialeah Gardens, Homestead, Kendall, Key Biscayne, Medley, Miami, Miami Airport Area, Miami Beach, Miami Design District, Miami Gardens, Miami Lakes, Miami Shores Village, Miami Springs, North Bay Village, North Miami, North Miami Beach, Opa-Locka, Pinecrest, South Miami, South Beach, Sunny Isles Beach, Surfside, Sweetwater, West Miami, Virginia Gardens, Coconut Creek, Cooper City, Coral Springs, Dania Beach, Davie, Deerfield Beach, Fort Lauderdale, Hallandale Beach, Hillsboro Beach, Hollywood, Lauderdale Lakes, Lauderdale by the Sea, Lauderhill, Lazy Lake, Lighthouse Point, Margate, Miramar, North Lauderdale, Oakland Park, Parkland, Pembroke Park, Pembroke Pines, Plantation, Pompano Beach, Sea Ranch Lake, Southwest Ranches, Sunrise, Tamarac, West Park, Weston, Wilton Manors.